Malta’s march towards nationhood was punctuated and in a sense defined by numerous instances of direct and indirect involvement of the Church in political issues. RAPHAEL VASSALLO analyses the uneasy settlement of a century of religious disputes. In 2005, the National Euro Changeover Committee hit upon the idea of a nationwide competition to choose a symbol to represent Malta on the obverse of the official Maltese Euro coin. With hindsight it is hard to say whether the initiative was brave or foolhardy, in a nation as quintessentially divided as Malta. Either way, to avoid unnecessary political bickering an early decision was taken to rule out any Maltese personalities. Instead the committee compiled a short-list of purely iconographic symbols: featuring, among others, the eight-pointed Maltese cross. They then launched an online poll to determine the winner: significantly allowing the possibility for participants to suggest alternative themes of their own. This tiny window of opportunity was all that was needed for a small but vociferous lobby group to demand the inclusion of the ‘Baptism of Christ’ among the options: a historic statue in St John’s Co-Cathedral in Valletta, which, despite not having any immediate national connection, nonetheless attracted a sizeable portion of the online votes... together with comments to the effect that our choice of image for the Euro coin, was also a chance to broadcast “Malta’s Christian values” to the rest of Europe. It was only after the personal intervention of former Gozo Bishop Nikol Cauchi – who reasoned that Christ himself might have had a thing or two to say about appearing on a symbol of Mammon – that the option was sheepishly withdrawn. But the incident, trivial as it may appear, served to illustrate the undeniable fact that, given a choice, many people in this country would opt for a religious icon to symbolise the State. Nearly 50 years since independence, Malta still evidently suffers from an identity crisis when it comes to weeding the secular from the religious. Our institutional symbolism remains quintessentially religious in nature: the Archbishop addresses the nation on Independence Day, and his homilies on the occasion of other national holidays invariably take pride of place among the main headlines of the day. Members of Parliament swear allegiance to the Constitution of Malta, but kiss the crucifix: the standard form of oath-taking also in the law courts. In a sense, it is the inevitable outcome of a series of compromises, dating back as far as the 1920s and 1930s, which saw to it that Malta’s development towards self-determination as a Independent State took place in perfect step with a gradual solidification of the Catholic Church’s foothold in all aspects of Maltese politics. From the outset, the acquisition of “responsible government” in 1921 had saddled Malta with a political system in which the Church automatically controlled a number of seats in the upper house of parliament – much to the chagrin of Prime Minister Lord Strickland, who in the late 1920s moved to amend the Constitution and curtail the Church stranglehold over the Senate. These early battles – which culminated in the excommunication of Lord Strickland in 1930, as well as a dramatic but unsuccessful assassination attempt that same year – would provide a blueprint for the future development of Church-State relations, whereby Archbishop Mikiel Gonzi repeatedly insisted that no political development could be contemplated on the island, without first providing guarantees for the Church’s privileged status as moral torchbearer. In fact, when, almost exactly 30 years later, Archbishop Mikiel Gonzi issued the infamous Lenten Pastoral instruction of March 1961 – whereby the executive committee of the Malta Labour Party found itself excommunicated, and it was declared a mortal sin to vote Labour, to read, distribute or advertise in Labour owned-papers, and to attend Labour meetings – it was ultimately a logical progression from the Church’s traditional perception of all political developments in the context of a struggle to preserve its own cultural hegemony. Often as not the feud was of an entirely personal nature, as Labour’s leader Dom Mintoff proved to be every bit as fiery and irascible as Archbishop Mikiel Gonzi himself. But what was at stake was not personal at all. It was arguably the soul of the nation: or at least, its immediate political direction. This was at best uncertain in the immediate aftermath of World War Two, when Malta found itself facing a major housing crisis and the collapse of its military economy, at the height of the international depression. Popular discontent was rife, and following failed negotiations with Britain over Malta’s eligibility the Marshall Aid plan, it became apparent to all that the current model of “responsible government” – whereby the government was “responsible” for everything except defence and the Exchequer – was no longer tenable as a long-term political model. Both major parties of the time – Enrico Mizzi’s Nationalist Party, and the Malta Labour Party, under Dom Mintoff since 1949 – concurred that a new Constitutional arrangement was urgently required: but they differed wildly in their respective proposals, with Mizzi favouring “Dominion Status”, while Mintoff had hit upon the more radical concept of full social and political integration with Britain. As a second option the MLP also favoured “self-determination” – a euphemism for Independence – but by the time the country geared up for the 1955 election, it was clear that no matter the outcome, a serious political earthquake was bound to be on the horizon. And as the British Empire began to crumble the world over, this reality dawned also on the Maltese Church. The political landscape had changed considerably since Gonzi joined Archbishop Marius Caruana in issuing the 1930 clerical sanctions against Strickland. The Church was no longer entitled to automatic representation in Malta’s parliament – but it retained numerous other privileges, and being reluctant to relinquish any more, Gonzi viewed both available political options – Integration and Self-Determination – with thinly disguised scepticism. When the Labour Party came into power in 1955, Mintoff immediately embarked on Integration negotiations with Britain, and somewhat prematurely called a national referendum for the following year. But Gonzi was dissatisfied with Mintoff’s claims that he had secured “special concessions” for the Church in the ongoing talks; and ordered the faithful to boycott the referendum. The resulting campaign was as acrimonious as the result was controversial. Effectively, Integration carried the day, but on such a low turnout that the Nationalist Party immediately branded the victory non-representative. By this time Mintoff found himself fighting a war on two fronts: for Britain refused to recognise the referendum result; and meanwhile, Mintoff’s hints of a closer rapport with Iron Curtain regimes and Third World liberation movements earned him the open hostility of Britain and Catholic Church alike. Upon the failure of negotiations in 1958, Mintoff promptly ditched Integration for Self-Determination: but the prospect of independence – especially under an outspoken left-wing secularist, and potential ally of the Warsaw Pact – now rang alarm bells in the Archbishop’s Curia. Both sides exchanged invectives in the ensuing war of words. The 1960 Lenten Pastoral declared that it was impossible to be a Socialist and also a good Christian. For his part, Mintoff accused “Sir Michael Gonzi” of collaborating with the British against Malta’s interests. Matters came to a head when the Malta Labour Party published its celebrated “six points”… which included the curtailment of several Church privileges, among which: the right of citizens to Civil Marriage; the rights of parents “to decide whether their children should have religious instruction or not”; The right of the police “to enter churches to stop interference to public meetings from church property”; and the right for free general elections “without the imposition of mortal sin by the Church”. It was in this atmosphere of paranoia and mutual disparagement that, on 17 March 1961, Archbishop Gonzi issued his celebrated interdictment of Labour supporters – with effects that would reverberate for decades, and can still be felt today. Perhaps unsurprisingly, the Nationalist Party went on to win the 1962 election with a mandate for Independence. But though the Church, through its sanctions, had contributed to this victory, Gonzi proved equally keen to defend the institution’s privileges from any changes brought about by the resulting Independence Constitution. The resulting Independence Constitution, still in force today, reserves its second Article to safeguarding the status of the Catholic Church as moral torch-bearer of the Maltese islands. Particularly it grants the Church the “right and duty” to teach the values of right and wrong – a proviso which neutralised at least one of Mintoff’s six points, and which would return to haunt Church-State relations two decades later. On 21 September 1964, Malta limped into Independence, with its Opposition leader still labouring under an excommunication edict. Prominent Labour stalwarts were compelled to marry in the sacristy; and most hurtful of all to the older generation of Labourites, absolution was withheld from declared Labour voters, and those of the executive who died before the lifting of sanctions were buried on unconsecrated ground. Gonzi, it seems, had prevailed over the forces of self-determination, and had successfully defended his Church’s cherished privileges in the face of the threat of secularism. 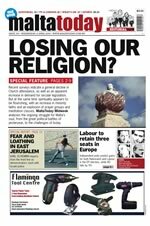 But it proved to be Pyrrhic victory, for the 10-year feud with the Malta Labour Party had taken its toll, and the Catholic Church knew it would probably never regain the full, undivided trust of a divided people, having so openly and aggressively supported one side at the expense of the other. In the end, Gonzi’s fears proved justified, but only in part. Mintoff became Prime Minister in 1971, within just a year after the lifting of the “interdett”; and immediately he embarked on a series of reforms which would effectively curtail many of the Church’s privileges. Civil marriage was introduced in 1975, fulfilling the first of his six points; but Mintoff stopped short of also introducing divorce, and for the moment at least, the Church’s right to teach religion in schools was uncontested by the State. But tension persisted all the same, in part fuelled by Mintoff’s aggressive reforms in other sectors. By now there had also been a change in leadership of both the Nationalist Party and the Church. In Eddie Fenech Adami, the Opposition discovered a powerful voice capable of counterbalancing Mintoff’s rhetoric, and also reorganising his ailing party structure to be able to mobilise large crowds in protest against what was increasingly seen as a dangerous and volatile regime. Like Borg Olivier, Fenech Adami bolstered the PN’s natural allegiance with the Church; but he lacked his predecessor’s reputation for libertarianism, and as such promised to be the ideal candidate to guarantee the Church’s privileges in a post-Mintoff and Gonzi future. As for the Church, incoming Archbishop Joseph Mercieca proved less openly confrontational than Gonzi: making for a conciliatory atmosphere which would eventually result in the somewhat chaotic blur between Church and State bequeathed to us today. As things stand, the Church very soon found itself embroiled once more in open confrontation with the government as a direct result of the doctors’ strike of 1977. In the ensuing nationalisation of the medical sector, Mintoff issued new conditions governing the licensing of private hospitals... which directly affected the Little Sisters of Mary (aka the Blue Sisters), who ran the eponymous hospital in Sliema. In December 1980, six of the nuns were given a stark ultimatum by the police: either to leave the island immediately, or face court proceedings. The Blue Sisters were flown out of Malta, and the hospital itself closed down altogether in 1981. A few years later the same government, this time under Karmenu Mifsud Bonnici, finally turned its attention to private schools, nearly all of which were at the time owned by the Church. In September 1984, a “spontaneous demonstration” by Dockyard workers resulted in the ransacking of both the Archbishop’s Curia and the law courts: that same year, Mercieca announced that, given the climate of tension and violence, he would not open Church schools at all. Fenech Adami became Prime Minister in 1987, and is today credited with restoring normality to Malta after three decades of tension and violence. Insofar as Church-State relations, he also restored those privileges which had been eroded, in full or in part, during the 16-year Labour regime. In 1991, he signed a treaty with the Holy See, whereby his government undertook to subsidise teachers’ salaries at Church schools, with the result that the same schools are now the joint responsibility of both Church and State. Two years later he took the unprecedented step of signing away jurisdiction over the entire Marriage Act to the Holy See... thus effectively neutralising any possible progression of Mintoff’s 1975 reforms, and placing divorce on a permanent backburner. But although political tension had abated since the 1960s and 1980s, the European Union issue would once again set the two major political parties on a direct collision course over Malta’s political future. Fenech Adami had long advocated that the country’s rightful place was within the Union, and by the early 1990s he had set in motion the necessary fiscal and economic reforms for accession negotiations to commence. This would create fertile ground for discontent, and the Labour Party, now led by Alfred Sant, successfully capitalised on these concerns to briefly derail EU accession between 1996 and 1998. Upon re-election to government, Fenech Adami embarked on a five-year campaign which once again brought Malta to social and political breaking-point, characterised by scaremongering tactics on both sides, and a near universal tension after March 2003... when Alfred Sant emulated the PN’s tactics of 50 years earlier, and refused to recognise the referendum result. Countering Sant’s anti-EU rhetoric, Fenech Adami mobilised a coalition of social partners involving nearly all social partners and NGOs. But the Church remained conspicuously silent on the issue: mindful of the dangers of direct involvement in political controversies, it limited its observations to non-committal appeals for calm and unity. All the same, the Church had every reason to be apprehensive of the prospect of EU membership. After all, the Union frowns upon privileges accorded to religious institutions, and which actively promotes female reproductive rights, among other issues anathematised by the Church, as part of its international development aid drive. Whether through backdoor negotiations with Church authorities, or more likely to neutralise Opposition arguments against membership, the resulting Accession Treaty, signed in April 2003, included a protocol recognising Malta’s right to decide for itself on matters relating to abortion and female reproductive rights. It was the last echo of a 70-year-olf leitmotif, whereby all Malta’s political developments were underscored by concessions to our “Catholic identity”. And so, on to the final chapter in the ongoing saga: five years into EU membership, popular demand for further institutional reforms (specifically, the introduction of divorce) have once again galvanised the Church into seeking guarantees for its privileged status. On September 8, 2008, Bishops Paul Cremona and Mario Grech launched a scathing attack on the “threat of secularism” in their Victory Day homily: comparing the struggle against secularism to Malta’s wars against the Turks and the Fascists – and subliminally equating divorce with abortion and euthanasia – in what Ethics Professor Kenneth Wain described as “a declaration of war”. Significantly, less than a month after the Bishops’ condemnation of secularism, Prime Minister Lawrence Gonzi withdrew his earlier commitment on the need to “kick-start a divorce debate”: effectively illustrating that what Church and State had so thoroughly joined together, civil society was not going to put asunder without a fight.